There are two ways time travel can be achieved. Either board a stable spaceship and fly into a wormhole, or visit ‘Louis’ at Richardplatz in Berlin’s Rixdorf borough. The difference is that they do not serve Schnitzel in wormholes. Entering ‘Louis’ is like going back to 1980. Visitors will still be in 2019 while standing on the sidewalk, but once their first foot touches the restaurant’s linoleum floor, they will be catapulted 39 years back in time, like Marty McFly without the Flux Compensator. The red and pink floor does not fit the walls in Kermit green at all. Imagine the most kitschy place you have seen in your life and multiply it with a ton of bad taste. This is how you get there. But here, at ‘Louis’, it does not matter at all. 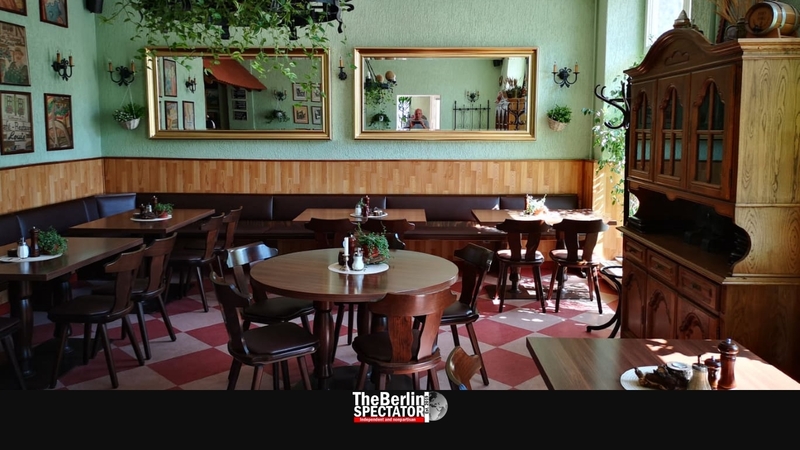 This place is all about Austrian food, and mostly about thick pork Schnitzels the size of Denmark. Whoever orders the Klassiker will hear how it is being prepared through the open kitchen door. Once the sound of frying and cutting stops, the Schnitzel is about to be delivered to the table. Once that big moment arrives, first-time visitors usually stare at their plate in disbelief. This pork Schnitzel is far larger than the plate. It is breaded, juicy and it buries a rather large portion of fried potatoes. This giant meal, which will feed four grown men, is probably not only the most gigantic Schnitzel in the Milky Way, but also the most affordable huge Schnitzel mutation, at a price of around 15 Euro (17 Dollars or 13 Pounds Sterling). 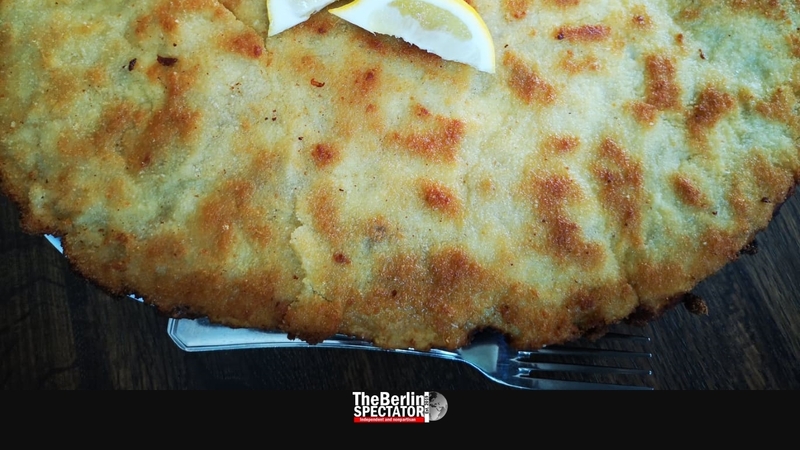 O.k., the giant Schnitzel may not be kosher or halal. It is not exactly a politically correct meal, also because ‘Louis’ is not a Gluten-free or vegan place. But it is impressive and delicious. For anyone who does not want to consume Schnitzel, there is a lot more. 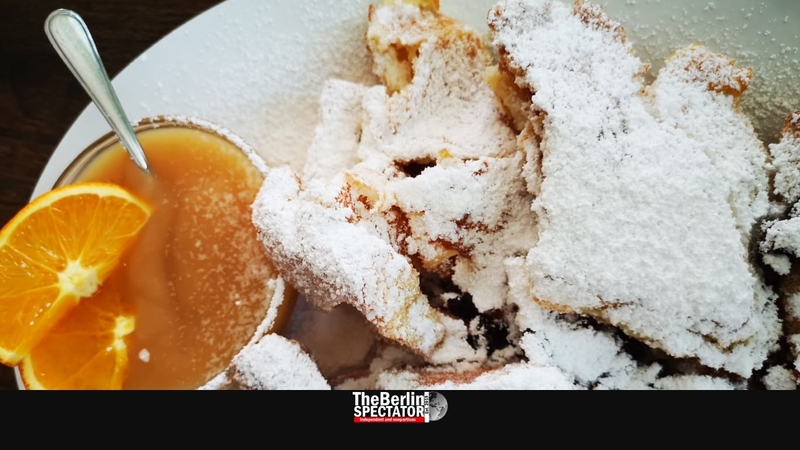 Apart from Cordon Bleu and other meat alternatives, ‘Louis’ offers Kaiserschmarrn. This cake-like, sweet Austrian dish comes with apple sauce, tastes well and looks wonderful. Another calorie bomb nobody should miss is the Apfelstrudel with vanilla sauce. Too full after the giant Schnitzel? Order the Strudel anyway. You can still start a diet tomorrow. ‘Louis’ is about eating properly. For supermodels, who are happy with half a sliced carrot for lunch, there are other places. Hardly any guests manage to finish their Schnitzels. The restaurant offers huge pizza boxes so that people can carry three fourths of their meal home and spend a week or two killing it. The Austrian Alois Offner established ‘Louis’ in 1994, a quarter century ago. Last year, in 2018, he became a pensioner while his daughter Anita Jemrić took over. Her concept remains the same: She continues offering the largest Schnitzel in the universe while not changing the time travel aspect either.